Customized app version is new app instance, not an update performed on app instance downloaded from the SharePoint Store. Total customization cost = app license cost + 300 USD of initial setup fee (only first customization) + cost of implementing changes. 2. Add new tab on the form with following fields: Name, Description, Price etc. How to order app customization? 1.Send us email with customization scope (see question above for details). 2.We will send you detailed estimate of costs. 3.If you decided to order customization service, please inform us by email. 4.When we finish our work, we will send you customized version of the app for verification. How to install customized app? 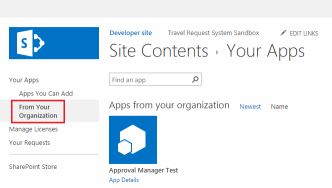 After ordering customization service, you will receive standard Sharepoint App Package (single file with .app extension) to install in your private App Catalog. 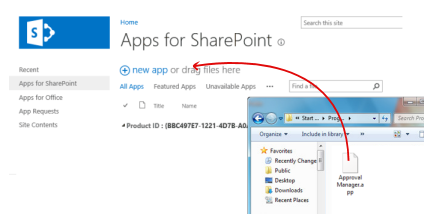 App Catalog is document library on SharePoint where apps for SharePoint can be published (only inside your organization). You can create App Catalog Site Collection with just a few mouse clicks, here is sample video tutorial.